Learn what chaos is and how it shows up in markets. Learn the secret of the streaks, and how to trade them. This special expires at 4:00 PM, Mountain Time, April 30, 2019. Time remaining is:248 hours 56 minutes . This web site represents my market work over the past 3 decades. 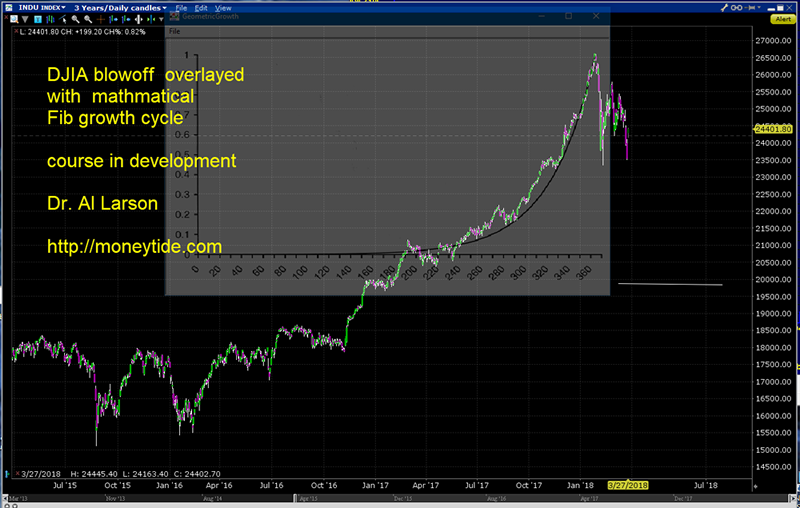 Since I first read Dewey's Cycles-The Mysterious Forces that Trigger Events in 1974, I have researched what moves markets. I have developed two bodies of knowledge-Market AstroPhysics and Market Chaos Theory. These technologies provide a theoretical framework for market behavior, which is then used to develop mathematical models for forecasting, and for identifying fractal patterns markets produce. This knowledge has let me develop some unique trading tools for finding the most profitable moves in markets. These theories are based on the idea that market prices have two components-a fundamental component of about 60%, driven by business basics, and an emotional component of about 40 per cent. 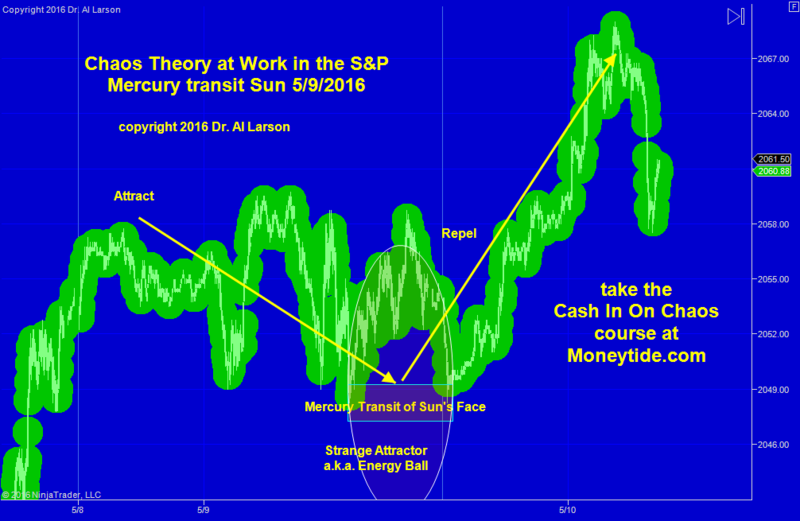 I have been able to link the emotional swings in markets to tides in the earth's electric field. 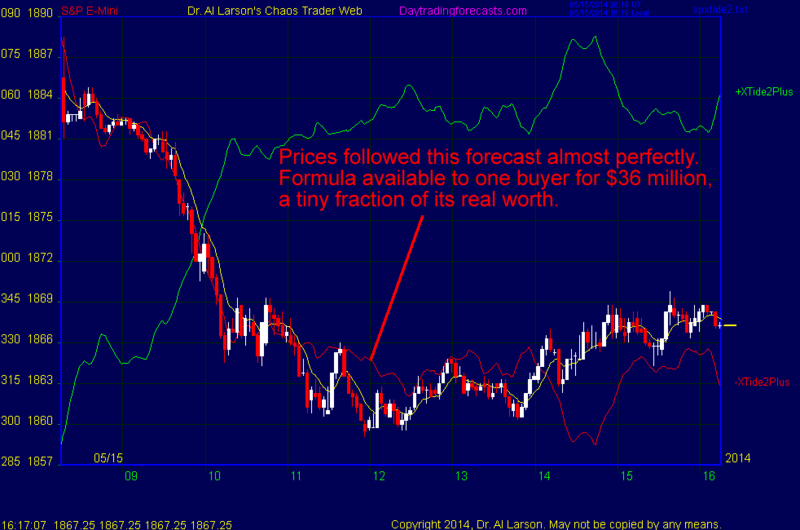 I have developed mathematical models of these changes and use them to forecast future price swings. My forecasts are unique in that they are energy forecasts, and do not use any price data as input. I then both trade and watch the markets, to further improve my knowledge and to verify that my theories hold water. Much of this is documented in the free Reading Room. More information can be found in my book, Market AstroPhysics and Chaos, videos tapes, and research reports. I have shared my knowledge primarily through my four home study courses-Cash In On Chaos, the Fractal of Pi, the Face of God, and Market AstroPhysics Master's Course. . These confidential courses are designed for the serious private individual trader. 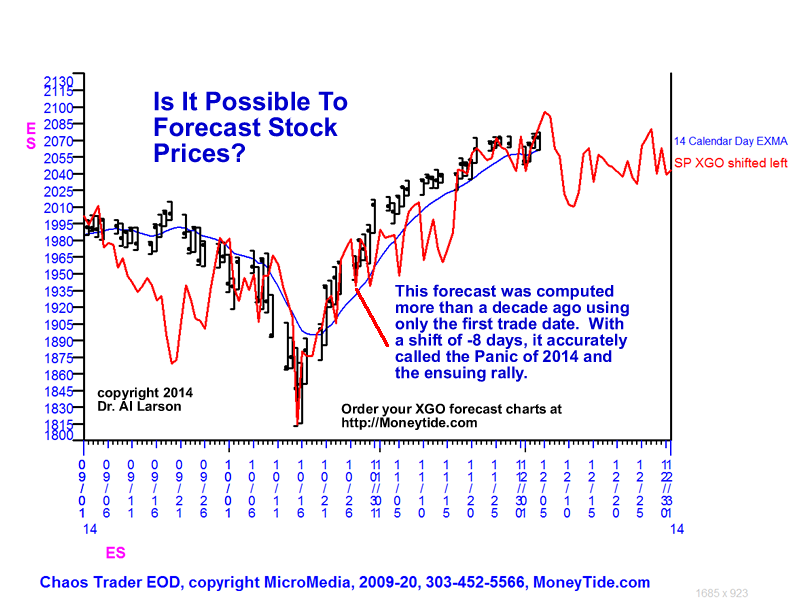 I have developed two primary forecasting methods-XGO, for position trading and MoonTides, for day trading. A sample XGO chart can be seen here. Many samples of the MoonTides can be found in my archive of past Chaos Clinics. I sell software that implements the XGO forecasts. I also offer a daily S&P/Emini hotline, supported by a separate real-time site at DaytradingForecasts.com. If you sign up for the free weekly email, you can see our forecasts in action on the free Friday Chaos Clinic at DaytradingForecasts.com. On that site, you can review past Chaos Clinics, past hotline emails, and our track record. From the home page, go to Public Pages, and read the Trading MoonTides Tutorial. I have also published the Cash In On Chaos Newsletter. Past issues are released when each new issue comes out. You can read past issues here. These newsletter show many examples of my XGO and filtered XGO energy forecasts in practice. This newsletter will be terminated with the September 2007 issue. Past newsletters will remain on the site as a resource for others. All my products are summarized and can be ordered in my catalog. Effective March 28, 2007 I have stopped shipping physical products, and have put all my courses online. My work has led me to an interesting view of our universe, described in my book, Your Electric Life. This book explains how we are all energy beings in an energy universe. Markets, too, are energy systems. And all energy systems have basic properties and behaviors. Understanding them is interesting, important, and potentially profitable. Your Electric Life ebook is available on Amazon.. If you do nothing else, read it. Controlling one's own energy environment is also important. I have developed some energy field products that help traders do that. The Concentration Headband and Energy Charging Kit have helped many traders. Unfortunately, these products were discontinued due to the death of my clerk, Wava, and my semi-retirement. However, I have published information on making your own. See the Free Stuff page, links 3, 4, and 5. Planetary motion is involved in what I do, but I do not consider myself an astrologer. I am a scientist. I observe very carefully. I make measurements. I develop theories. I write equations. I program those equations. Those equations produce predictions. I observe the outcome of the predictions. I use those predictions in my trading. Then I go around the loop again, always trying to improve. I will be done when trading is a science, and not an art. My current models and formulas are state of the art. They work. They are tradable. And as I learn more, I constantly improve them. But they are not perfect, so I am not quite done yet. This is a fascinating journey. I have made great progress. But full retirement looms on the horizon, and some day I will no longer share my work. I am far from having all the answers. But I have found many, and I am happy to share them. I know that when I get my life review, it will not matter how much money I made, but how many fellow travelers I helped along the way. If I can be of help to you, let me know. I focus my energies on two groups of traders - Certified Chaos Traders and Chaos Trading Masters. Certified Chaos Traders (CCT's) are those who have taken all 4 of my basic courses - Cash In On Chaos, Fractal of Pi, Face of God, and Chaos Trading Made Easy. I have added a new special "room" in my http:\\daytradingforecasts.com site, where the CCT's will be able to share charts and chat without worrying that the public is watching so they can't talk about the good stuff. Together, this will be the Chaos Trading Team. Chaos Trading Masters are CCT's who also have taken my Master's course. These are those who want the ability to do their own research and programming. This private course is on a case by case basis. Thanks for coming to my site. Please come by again. On of the great pleasures of my work is having some excellent students. The best of all has been Dr. Greg Meyer, MS, MD. He has not only mastered my material, but extended it by combining my XGO forecasts with my ZD filtering to make longer term forecasts. That Meyer Method is now used in my newsletter, and incorporated in the WinXGO program. Greg uses these tools to trade successfully. This is Greg on a recent visit to my office. 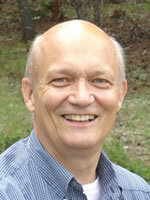 Over the last 15 years I've studied Dr. Larson's work from building block courses through the Master's Course. 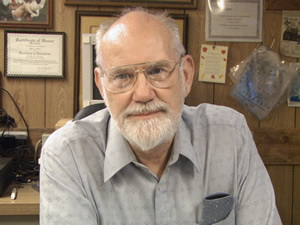 Dr. Larson applies sound scientific principles to the developement of his courses, as his PhD suggests would be the case. He has developed insightful programs and methods based on fundamental principles which give increasingly unprecedented accuracy as the course levels advance. I rely on his programs and insights daily, and proceed with confidence that solutions to market movement can be worked out as accurately as engineering problems could be solved when I was an aerospace engineer. Al formerly used the pen name Hans Hannula. It was his great grandfather's name. When he was working at Bell Laboratories the beurocrats would have prevented him from publishing anything as unorthodox as his first article, In Search of the Cause of Cycles, which linked market cycles to planets. This landmark article is in the book of reprints, Market AstroPhysics and Chaos, available in the [Chaos Trader's Catalog]. In September 2018 I changed the format of my Chaos Clinic to be more of a blog, with charts and comments similar to my old newsletter. You can click on these links, read the post, then use your back button to return to the list of links. Chaos Clinic 11/16/2018 Are Tech Stocks Done? Chaos Clinic 11/30/2018 Is Gold Set to Rally? Chaos Clinic 12/07/2018 Will It Be An Unhappy New Year For the S&P ? Chaos Clinic 02/01/2019Can This Tech Stock Bounce Back? 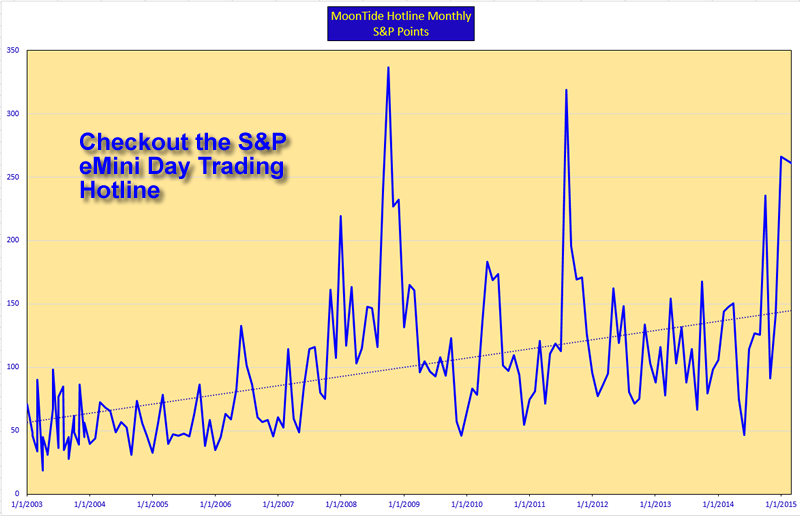 Chaos Clinic 02/15/2019Did Santa Deliver S&P Coal? Chaos Clinic 02/22/2019Is This Short S&P ETF About To Rally? Chaos Clinic 03/01/2019Is the Euro About To Rally? Chaos Clinic 03/08/2019Has Santa Left The Market? MoonTide indicator and QPFE made available for NinjaTrader. All eMylar programs were updated 1/25/2011. Please access your online courses with the MTReader to download these updates. I have added a new product for Certified Chaos Traders - the eMylar overlays from Cash in On Chaos, Fractal of Pi, Face of God, and Chaos Trading Made Easy, on a flash drive. See the catalog for details. I have added a product to my catalog - a 500 year astro database. See the catalog page for the MicroMedia Planetray Database. Added XGO forecast example at bottom of this page. How I Knew The Party Was Over. This chart from daytradingforecasts shows the power of Market Astrophysics. It is indeed possible to make profitable energy forecasts based on what I teach in my new Essentials of Personal and Market Astrophysics (EPMAP). Go to Dr. Al's YouTube channel for more.